THIS IS A masterful piece of filmmaking: measured, confident, compelling. It tells the story of James B Donovan (the ever engaging Tom, Jimmy Stewart, Hanks) a successful insurance lawyer (and one of the prosecutors on the Nuremberg trials). Donovan has been persuaded by the government to represent Rudolf Abel (the brilliant English stage actor, Mark Rylance), a Russian spy. The government’s appointment of Donovan is a piece of PR window dressing: their desire is not really about justice; it’s merely to give the world the impression of great, blind, American justice at work. Donovan – decent, earnest and honorable – however is the fly in the ointment. He takes his job seriously. For him, the demands of the constitution mandate that even this most hated man in America deserves a fair trial. But the government (as governments go) and the public, baying for blood, are unconcerned about the niceties of justice and the constitution (think Guantanamo). They all just want this ‘traitor’ (He’s not a traitor, Donovan argues: he’s a Russian. He’s a spy. He was doing his job) dead. And therein lies the idea that drives this profoundly relevant film: America was built on and stands for certain deeply moral ideals… but these ideals the film suggests are forever threatened by expediency and a kind of squalid populism. Spielberg offers up a number of -slyly critical – contrasts: when Abel is convicted and given thirty years (spared the death sentence just in case he’s of greater value alive), the American audience at the trial boos and demands the death penalty. But when an American spy is similarly sentenced in Russia, for ten years, the Russian trial audience there cheers. To them, justice has been done. We see multiple scenes of people desperate to flee the walled in, increasingly lawless East Berlin for…a ‘free’ West. But really this ‘free West’, as embodied by America, is a place where the rule of law is dangerously fragile… where Donovan, as the archetype of fearless justice, becomes a hated person simply for upholding the law. The story turns when an American spy aircraft is shot down over Russia and, fearful of their secrets falling into enemy hands, the two governments, using proxies, back channels and East Berlin, arrange a prisoner swap: Abel for the shot down pilot, Gary Powers (Austin Stowell). Once again, Donovan is dragooned into service as the one who must negotiate the swap, in secret, as a private citizen, with an ever-shifting nest of bureaucrats, spies and secret police. As for Spielberg’s directing: his careful observing eye (little touches, like the click of what would then have been new fangled ball-point pens) his textured moodiness (Donovan/Hanks running through the streets of a dark, rainy East Berlin) and his restless camera (with long time cinematographer Janusz Kaminski) that drifts through crowds, creeps into half-lit rooms and allows us to discover this world of shadows and danger as if we were there. With “Bridge of Spies”, Spielberg has given us a terrifically tense action movie… where there really isn’t very much action. People meet in bars, in jail cells, in board-rooms; they drink Scotch, they stare down each other. And it’s all as electrifying as “Spectre”. And more: it’s surprisingly tender; and, lifting it well above its genre, believably heartwarming. “THE HUNGER GAMES: Mockingjay Part 2” is the less than mellifluous name of the final (thank God) in the Hunger Games’ endless flow of movies. The name is as long as the movie felt. On and on and on. Not unlike the endlessly drawn out yawn of “The Hobbit”: a novella spun into faux cine-operatic, money-making, multi-series multiplicity. By now you know the story of THG: The games are the annual live entertainment sport in which a team of (mainly) young persons chosen from their districts, fight for their lives… to the delight and enjoyment of all. It’s the way the government of the Districts of Panem keeps the population compliant and entertained even as they suffer and starve. (They call it hunger Games, we of course call it the FA Cup). Katniss Everdeen (Jennifer Lawrence) and her partner, Peeta Mellark (Josh Hutcherson) had been past winners and star crossed lovers. But her sense of justice and her fearlessness has made her more than a past winner: she’s become the heart, soul and face of a bubbling rebellion. The first part of this drawn out finale was a really fine movie. If you remember, it dwelt on the idea of identity and image: Katniss’ integrity and refusal to be shaped by the image masters of the state made her, ironically, the ideal image of the rebellion. Hers was an image founded on her uncompromising sense of identity. “Mockingjay Part One” ended with the love of her life (the vapid Peeta) captured by the Capitol and being turned into her opposite image number…epitomized by his own loss of identity. Part One managed to nicely balance a quieter more introspective side (Katniss is prone to nightmares…she’s in love with a man who is morphing into her enemy) with a few startling bursts of explosive action…the rhythm of the movie worked. Part two however has lost this finely calibrated balance. The story tells of Katniss’ never quite credible need for revenge…to kill President Snow (Donald Sutherland), the overlord of Panem. She’s leading a small group of rebels into the heart of the Capitol whilst at the same time triying to recover the soul of her sold out lover (Peeta). Into this mix there’s deceit and the inevitable pollution of power. The elements are all there, all glossed up with Philip Messina’s (“Ocean’s Eleven”) superb production design. Sadly the combination of a characterless Julianne Moore as President Coin, the bureaucratic leader of the rebellion (who could win an award for the most expressionless acting of the year), a generally faceless enemy (Snow the bad guy is reduced to a few avuncular statements and has been replaced by the anonymous threat of what are in effect high tech land mines), the menace-free Peeta (no more really than a puppet on a string) and a stunningly corny script (by the same combination of writers, Peter Craig, Danny Strong and Suzanne Collins) place all the emphasis for drama, tension, empathy and threat on the sole shoulders of Jennifer Lawrence’s underwritten Katniss. All the, by now extraneous, characters from the past, who’d at least added sparkle and zest – Woody Harrelson’s Haymitch, Phillip Seymour Hoffman’s Plutarch, Stanley Tucci’s camp Caesar Flickerman and Natalie Dormer’s Cressida – have been reduced to cameos. THG Mockingjay Part 2 has shifted from the best of YA soft rock (Katy Perry) to an arhythmic one-note samba. All the multiple strands of the movie – the hissing nastiness of the overlords, the duplicity of Gale (Liam Hemsworth) and President Coin, the simpering romance with Peeta, Katniss’ own self doubts etc – are finally woven together in a meandering, formless way, with a few (admittedly tremendously exciting) action scenes substituting for the intellectual and visceral catharsis you’d expect after eight hours of viewing. And the last few scenes of the grand finale itself, like a monster who just won’t die, just carries on sin fin long after the curtains should have fallen, closing the franchise with a stuttering whimper not a bang. AARON SORKIN (“MONEYBALL” “The Social Network” “Charlie Wilson’s War”) and Danny Boyle (“127 Hours” “Slumdog Millionaire” “Trainspotting”) have teamed up to give us a juicily entertaining and rivetingly engaging movie: “Steve Jobs”. The arc of Steve Jobs’ trajectory is cleverly mapped out through three high octane, thrillingly scripted vignettes… that center around the launch of Jobs’ three iconic creations: the Mackintosh, the Next computer and his triumphant reentry into the company that had fired him, the i-Mac. Michael Fassbender’s Jobs is spellbindingly watchable… probably his best role yet (and for an actor of his calibre, that’s a big deal). The Jobs we meet is driven, ruthless, blindingly self-centered and mainly downright nasty. Boyle uses the dramas of the launches to suggest a symbiotic relationship between Jobs’ unstinting and merciless attention to detail, to absolute flawless perfection and the unquestioning reverence of his smitten followers. One thing leds to another. He also shows us that this adored messiah is one who, in private, is mainly loathed by his intimidated employees; and who, despite his vast riches, consistently tries to disown his own daughter. The perfectionist messiah is the far from perfect human. The point is, perhaps in the world of computing (of business) the past really is irrelevant… You’re only as good as tomorrow’s ‘next big thing’. But in the world of human relations, the past (your family) is part of who you are…your lifeline, your link to a more vital dimension of your real worth; and not something you can simply walk away from. But really this could be seen as Steve Jobs and his ‘circle’. It’s not a one-man show. Fassbender is matched step for step by an outstanding Kate Winslet as Johanna Hoffman – his most trusted confidant and the only person with the balls to stand up to him. Winslet’s Hoffman speaking in a slightly clipped Polish/Brooklyn accent is the solid, slightly dowdy conscience to Jobs, (in what is also her best and definitely Oscar-worthy role to date; she’s becoming ‘this generation’s’ Meryl Streep). The acting master class is rounded off by a very believable Seth Rogen as the bypassed, loyal, pissed off co-inventor of personal computing, Steve Wozniac (referred to as Woz, as if he too were just another expression of the past). Jeff Daniels is saddled with the unenviable role as the patsy in the ‘circle’: John Scully, the high flying Pepsi executive marketing guru who Jobs brought in to run the company and who, managing by the numbers, near ruins the company even as he orchestrates the dismissal of his former mentor. He is the anti-Jobs: boring, conciliatory, board-appeasing, research- besotted and without a shred of Jobs’ visionary, creative energy. In a telling confrontation between them, Scully just doesn’t ‘get’ Jobs’ (and ad genius, Lee Clow’s) groundbreaking ad, “1984”. And if you can’t ‘get’ great advertising, a pox upon your houses! For what Danny Boyle seems to be suggesting is that Steve Jobs was no mere super-talented computer geek (we have Bill Gates to answer to that one). He was the obsessed, passionate, revolutionary artist. Wozniac was the one building a new type of computer, Jobs was the one trying to change how the world functioned, how people communicated. The dialogue between them continuously revolves around this pretty fundamental dichotomy in world-views: between the computer as a tool and the computer as a means of almost spiritual self expression. Like any great artist, Jobs taught the world how to “think different”. And like any great artist, it’s the art you judge, not the man. IN HIS ‘PRELUDE’ to “The Lyrical Ballads”, Wordsworth spoke of poetry as “powerful emotions recollected in tranquility”. I guess that could be a fitting epigraph to Ai Weiwei’s tremendous exhibition now on at the Royal Academy. The Chinese artist has been tortured, incarcerated, beaten up, his passport confiscated, his studio burnt down and his workers harassed… such is the fear of the powerful Chinese government (the same one that treats Obama and Cameron with only mildly hidden contempt) to the power of his art. And powerful it certainly is, in its often jokey inventiveness. The exhibition largely charts Ai’s stormy relationship with the Chinese government (its crude surveillance, its futile harassment, its failed attempts to muzzle his outspoken anger) in what amounts to one extended self-portrait. It’s a portrait of an artist as a citizen. This portrait that Ai Weiwei offers, at its most obvious level, is that of the freedom fighter; one where the artistic imagination refuses to be constrained in the way that the man so clearly was. After his studio had been razed by the authorities, Ai WeiWei salvaged remnants of the destroyed place and reconstructed them into a series of sturdy walls (with all the symbolism suggested by the wall). You can destroy things physically, but you can’t destroy the idea behind them. The wrath of a government can never diminish the idea of art. In a sense we’re privy to an inseparable duality: between the man (the political prisoner, locked in a cell) and the artist (imagination unbound…those powerful memories and emotions recollected in tranquility). Since it is his self portrait, it’s also the artist’s not too subtle way of presenting himself as he would have the world see him…the work is as clever a piece of self branding as the anti-capitalist semiotic of the Coca-Cola logo on the jade vase. The Ai WeiWei brand is that of the fearless artist who cannot be constrained. The artist as truth guerilla. In this, the artist’s relationship with his public is a very modern, post pop-art one: his audiences are not so much museum goers as consumers. In the same way that they can relate to the Apple brand, Ai WeiWei courts his consumer base to relate to and buy into what his own brand of art has to offer: thoughtful and imaginative defiance against the super-state. The artist was once imprisoned for about three months in a small padded cell. There with him, not three feet away were two prison officers. They had been ordered to monitor his every move, even as he defecated, but to never speak a word with him. 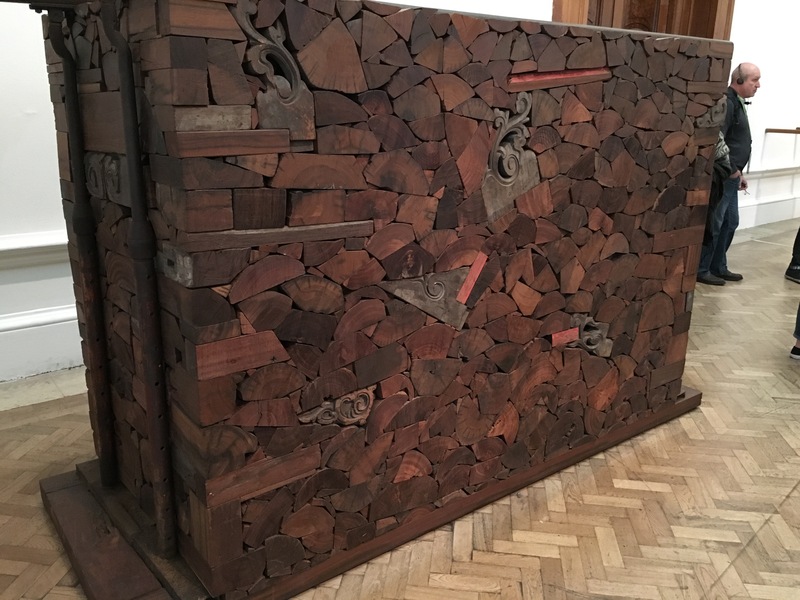 In a feat of extraordinary memory, Weiwei spent the three months committing every minute detail to memory, only to recreate and process the experience in a series of sculptures (they are boxes through which viewers could spy in – voyeurs all – on vignettes of the incarceration). It’s a giant finger up the authority’s attempt to silence him. And like him we live in a state pretty much owned by a small cluster of very powerful men (the symbolism of that Coca-Cola logo once again) whose control of the media shape what and how we’re meant to think about the things that matter to them. Perhaps this exhibition is more than the portrait of the artist… more a portrait of us all: mere consumers…not so much people as trained citizens (trained to consume) under the state’s supposedly benevolent supervision. But despite it all, the work is often mocking, often funny…he’s channeled his anger to rise above the primal scream; and there is about his pieces a wonderful joyousness…it’s the joyous celebration of Chinese craftsmanship. Unlike so many other artists whose atelier’s skills remain under wraps, Ai Weiwei very publicly trumpets the extraordinary craftsmanship of his team. To him, it’s a proud and very overt demonstration of Chinese brilliance. As a result, the art offers us this wonderful dynamism between the big picture themes of state oppression and crass commercialism (is a Jade jar worth more or less if a Coca-Cola logo has been stencilled across it?) and the equally relevant ‘small picture’ emphasis on the minutiae of the workmanship. He’s saying that the controlled anger of the artistic imagination is only really as good as the craftsmanship that allows the anger to communicate with others. Here are impeccably carved marble leaves of grass, where the strength and the brittleness of the material imprison a child’s stroller. Or here is a towering chandelier (the first image shown here) constructed around the frames of bicycles…the bicycles Ai Weiwei grew up with…it’s light emanating through memory.